including all the monsters and heroes. Heroquest is a board game set in the Warhammer Fantasy world where four heroes would descend into a dangerous dungeon to complete a quest and fight the forces of chaos. The game was for 2-5 players. One of the players was the 'evil wizard' who would control the various goblins, orcs, fimir, chaos warriors and undead. The other players would take up the mantle of one of the four heroes. Each hero has their own strengths and weaknesses - The barbarian was tough and powerful in combat but weak against mental attacks. The wizard could cast spells but was weak in combat. The elf was half way between the wizard and barbarian - he could fight well and cast some spells. Finally, the dwarf was a good fighter and could disarm traps. Each character had a certain number of attack dice and defence dice. When you wanted to attack someone, you would roll the number of attack dice you had. Each skull counted as a hit. Your target would then roll a die for each defence die they had. If the target was a hero, then each white shield they rolled on defence would negate one skull on attack. If the target was a monster, it would need to roll a black shield to negate an attack. 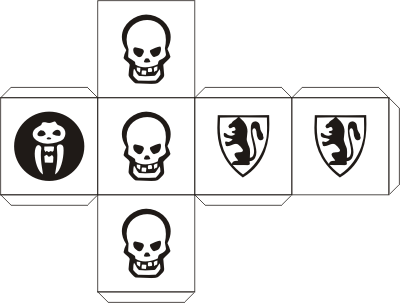 The target lost body points equal to the number of skulls the attacker rolled - the number of appropriate shields the defender rolled. Heroes could buy equipment or use spells to increase the number of attack or defence dice they rolled. There were various adventures to play with their own special rules. There were also several expansion packs and also Advanced Heroquest. If you search on the internet, you will find plenty of custom content, such as this website, this website and this website. Heroquest has also spawned a lot of computer games such as this one. Dave Morris wrote three Heroquest books which had a similar format to the Knightmare books - they all included a novella and a gamebook. The second and third books also included a scenario for the boardgame. The first gamebook from the first book, The Fellowship of Four, was actually a multiplayer gamebook, where the reader (or several readers) could play the barbarian, dwarf, elf and wizard. The game was designed so that the best victory could be achieved most easily with the combined talents of all of the heroes (also, since each hero could only carry either three or two items, one of which being a weapon, a solo hero would find it a massive headache to get the right items to carry.) Plus, some situations could only be avoided if players had someone else to back them up and most combats were against multiple foes so force of numbers was also a good thing. 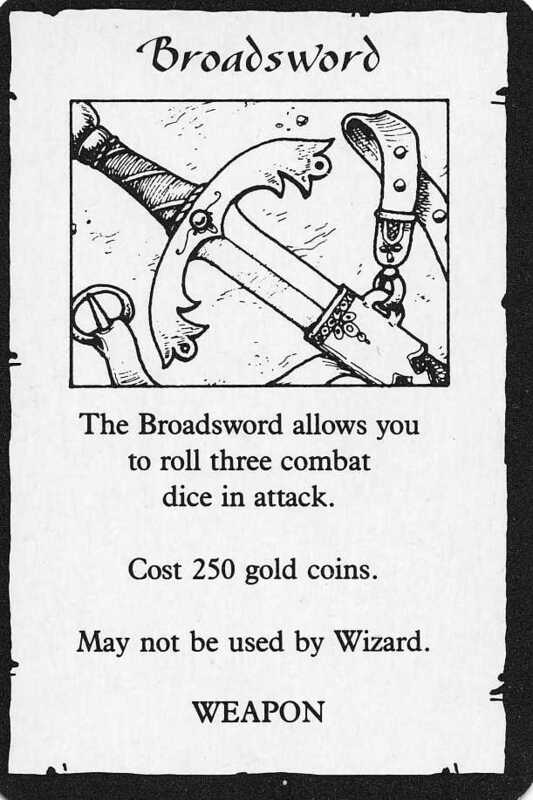 The gamebook was actually quite challenging but if you were daring and clever enough then you could be richly rewarded. There was some good mileage in such a short gamebook. I also enjoyed the story, split into five chapters. The first four focused on one of the heroes as they came together and the last one was how they saved the world together. 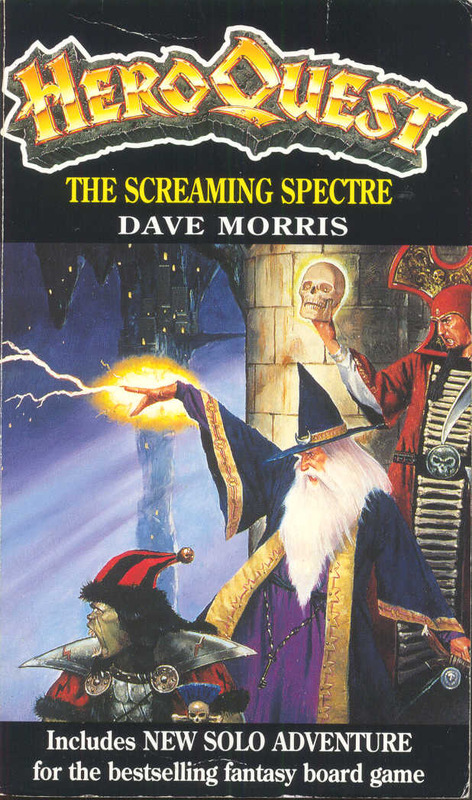 The second book, the Screaming Spectre, focused solely on the wizard character. The novella was a mystery rather than an action packed quest and so it was a little slower, but it was still good to watch it unfold. The mechanics of the second gamebook were also different as it focused solely on the wizard character. The trick to success was to choose the most effective spell to overcome the situation. Since the wizard is weak in combat, fighting is not usually an effective option. It was also a challenging gamebook but it could be bested with some thought to your spells. 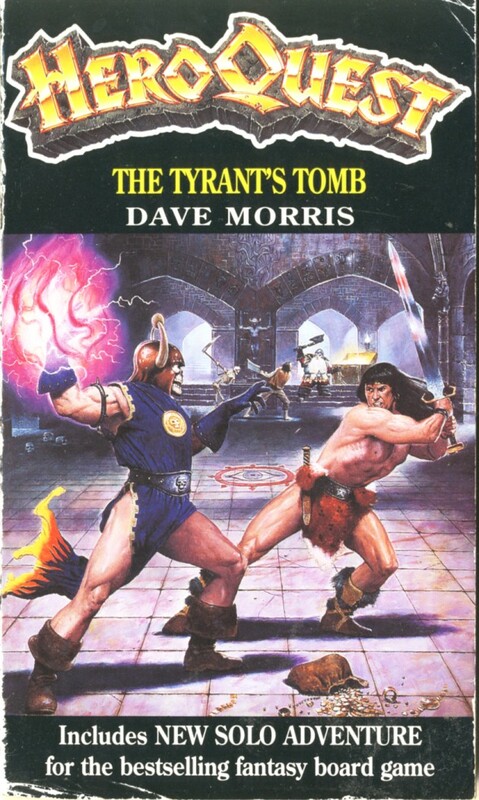 The final book, The Tyrant's Tomb, focused on the Barbarian. The story was more action packed and involved a barbarian trying to break into a tomb to get lots of treasure. Naturally, it all goes wrong. Unlike the other two books, the gamebook's story is similar to the novella. Strategy revolves more around gathering the correct items and combat as the barbarian cannot use spells. I think this is the most difficult gamebook due to the tough opponents and the lack of healing in the book. I don't know if there were ever going to be books based on the dwarf or the elf, but I guess Heroquest stopped being profitabe at some point. However, typing it into google still shows that it has a cult following. Like the Knightmare gamebooks, the Heroquest gamebooks could have been a bit longer; however, the Heroquest books are good to provide a few hours entertainment if you see them on Amazon as is the boardgame. And if you want some free gamebooks to read, how about heading on down to the Chronicles of Arborell where this year's Windhammer Competition gamebooks are out! There are 14 in all this year, so there will be something for everyone. We are currently in the voting phase which will end on the 30th October. To vote, you need to give the names of your 3 favourite books to Wayne Densley at vote@arborell.com.